I asked and you answered – soup is the next post live on TCL. Remember to Like The Chic Life on Facebook to get in on the next vote and enjoy other exclusive content. Similar to the muffins I blogged about recently, I’ve noticed that I don’t really find the soups I want to eat when I go out. 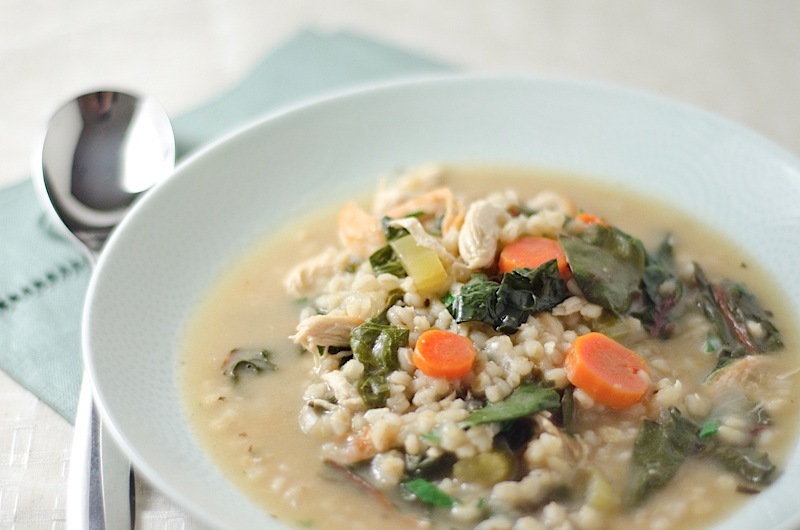 I like soups that are hearty, filling, and chock full of great ingredients. Most of the ones out there seem too brothy, boring, or void of interesting/filling ingredients. I’m going to work on developing more soup recipes this fall and winter so I can freeze the leftovers and have plenty of options to pull from in lieu of canned soup. Hopefully, you guys will enjoy making them, too. 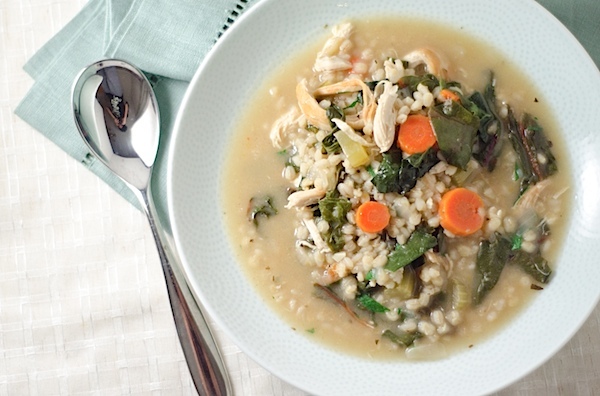 This new recipe has become a recent favorite – Chicken Barley Swiss Chard Soup. The love the chewy bite of the barley with the pulled chicken and tender veggies. I added swiss chard to try to up the vegetable-to-soup ratio. Forget beef and barley soup and try something a little lighter. This soup features chewy barley with shredded chicken (cook following the recipe or use rotisserie chicken) and swiss chard for a healthy ingredient boost. 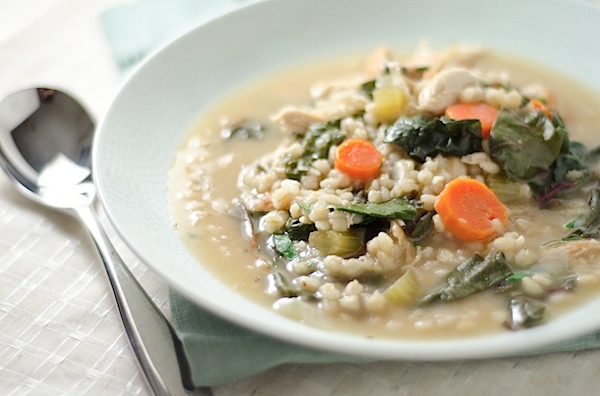 Two simple changes make this soup vegetarian and vegan friendly. Heat 1 tablespoon olive oil in a large pot over medium heat. Season chicken with salt and pepper (give each side a light sprinkle). When oil is ready, add chicken and cook till browned on both sides, about 5-7 minutes. Remove chicken to a plate and loosely cover with an aluminum foil tent. Add other tablespoon olive oil to same pot. Add carrots, celery, onion, and garlic. Cook until onions are translucent, about 5 minutes. Add broth/stock, water, barley, bay leaves, sage, and basil. Bring to a boil. Reduce heat to simmer, cover, and cook for 25 minutes. While the soup simmers, shred the chicken (or you can cut it into small pieces). Add chicken and swiss chard and cook for 10 minutes. Taste test and add salt and pepper to taste, if needed. Stir in 2 tablespoons fresh parsley, serve, garnish with additional parsley, if using, and enjoy. Reader question: Any soup requests? 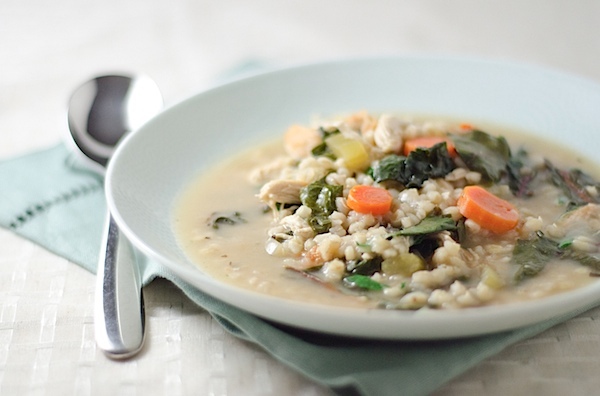 Are there any soup ingredients you’d like to see in an upcoming recipe? Do you have a pumpkin soup, or a soup that uses any special fall/winter ingredients? 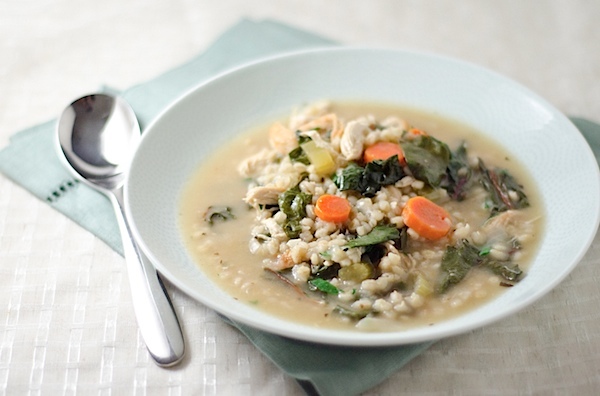 I have a butternut squash and farro soup recipe that I’ve been meaning to publish that you may enjoy. It would be great for after class! I just made this soup last night and I don’t think I’m exagerrating when I say that this was THE best chicken soup I’be ever made or tasted and that includes my Jewish mother. The only changes I made were to add spinach instead of Swiss chard and I added some dried thyme leaves. I used a rotisserie chicken and it was just amazing. So… Thank you very much. It’s will be a staple in my recipe collection.